Air Force Ch. (Capt.) Brandon J. Stewart, 86th ABW, Ramstein AFB, quotes Dr. Martin Luther King Jr. during a fiery speech at the Swabian Special Events Center, Patch Barracks, Jan. 22. 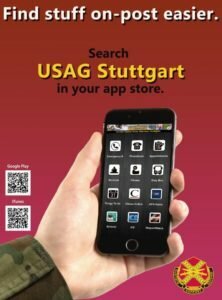 Photo by John Reese, USAG Stuttgart Public Affairs. Deep-felt vocals by the group PB&J and an energetic Air Force chaplain as guest speaker made for a compelling Dr. Martin Luther King Jr. birthday observation at the Swabian Special Events Center, Patch Barracks, Jan. 22. 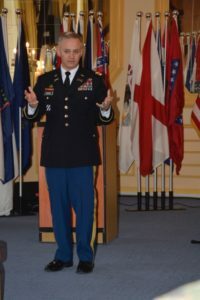 About 40 people attended the annual event conducted by the garrison’s Equal Opportunity and Equal Employment Opportunity offices, including the garrison command team. The musical group PB&J provided the National Anthem and two additional songs (a solo and a duet) during the program. Ch. (Capt.) 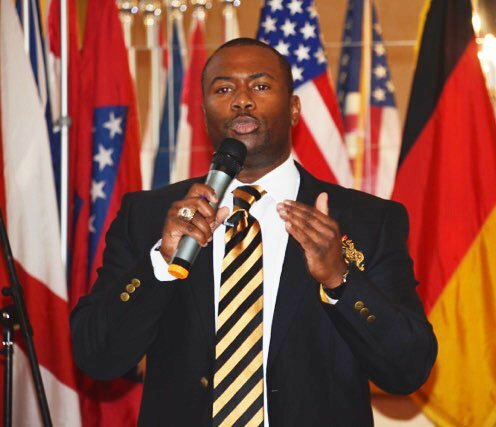 Brandon J. Stewart, 86th Air Base Wing, Ramstein Air Force Base, mixed in quotes from Dr. Martin Luther King Jr.’s “I have a Dream” speech with an overview of social justice in America today. Stewart challenged the audience to focus on the common good and less on self-interest as a means to improve the country and the world. “We’re waiting for everyone else to make this world great … start looking at yourself, and ask yourself, what is it that you can do to heal our society back together?” Steward asked. The theme, which remains the same from year to year, is “Remember! Celebrate! Act! A day on, not a day off!” The federal holiday has one where people with the day off are encouraged to perform some kind of service back into their communities. 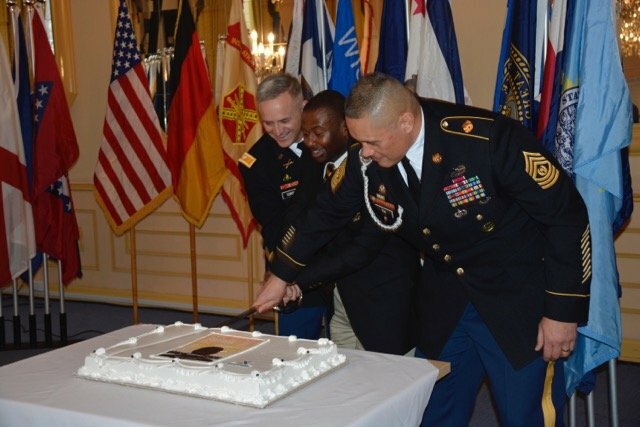 The US Africa Command will hold its MLK celebration Jan. 25. See the flyer below for more information.